After our disappointing winter/spring with no resident Eastern Screech Owls living in the nest box–wooing, mating, and tending offspring–we moved on to other concerns and projects. Personally, I missed the show, though I suspect the owls didn’t miss my oooing and aahing at their antics. And I know that an owl pair raised a family nearby, so that’s a consolation. Mama stopped by for a visit one day to show off the owlets, and occasionally I hear and see one or two at sundown. Once owl nesting season is done and the family has moved on, I typically don’t pay much attention to the nest box as it sits unoccupied and unadorned in the Red Oak tree. But in late June, and just out of curiosity, I plugged in the owl cam cable into the computer. Expecting nothing more than a placid scene of lonely leaves and discarded grass, I was surprised to see this: two snoozing Virginia Opossums, Didelphis virginiana. Two? The second is underneath the top–opossum bunk-bed style–but there are definitely two hairless tails, so unless there was an alien invasion of two-tailed opossums, there were two owl house interlopers on that particular day. Over the next couple of weeks, I checked the cam daily. 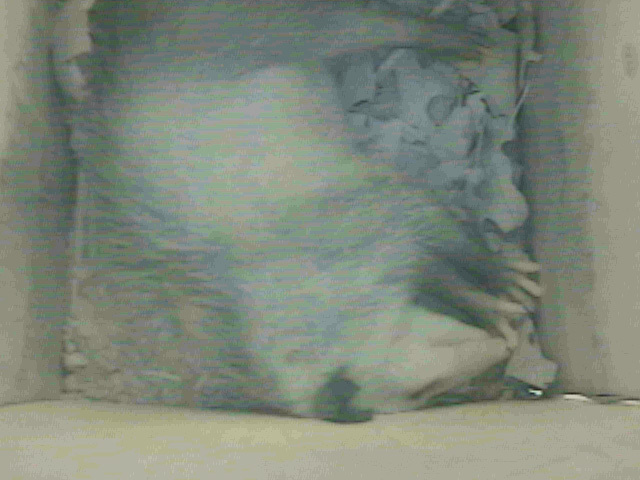 Sometimes a sleeping marsupial filled the box, sometimes the box was sans opossum. I assume the cuddling two are juvenile siblings, but I only saw them together that one (first) time. 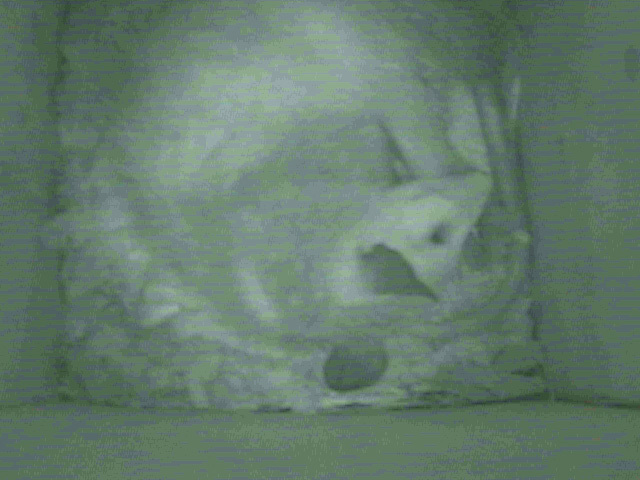 All other nest box peeks have delivered just the one opossum, but I’ll bet it’s one of the pair. Usually, he/she has been asleep, breathing peacefully; once, I viewed a very cat-like grooming session. Because we built the nest box for the owls and the last thing we need is a repeat of a nesting mama possum settled in the box like last winter’s squatter (which you can read about here), we’ve boarded up the place for the season. Closed for summer. Will reopen in December, 2017. If I could convince the opossums that this is only a summer home for them and I knew they’d vacate prior to the owls looking for their winter/spring nesting place, I wouldn’t object too much to hosting a nest box time-share. However, opossums are notoriously difficult to engage rationally and I suspect that my protestations at their presence and ultimate threats of expulsion would go unheeded. 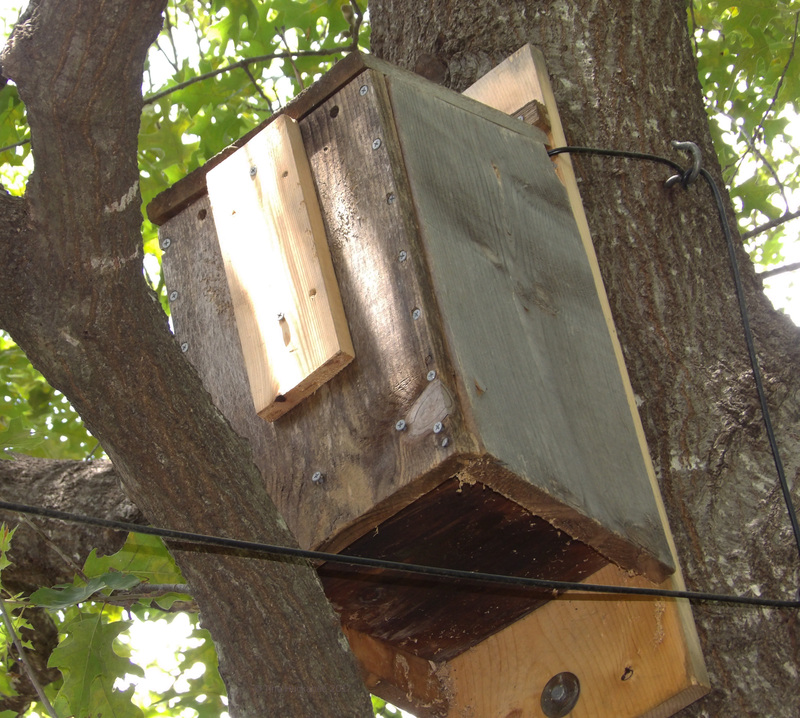 Therefore, the nest box will remain boarded up and none but a few ants and the like will be allowed! I see a juvenile opossum once or twice each week in the back garden, usually when flip on the outdoor lights to let my girl cat inside for the night. Kitty Astrud watches the marsupial movements, unimpressed and uninterested, showing no desire to follow. The individual(s) scurry through the garden to avoid detection; no doubt the opossum is pleased when the light goes off and once again he/she has unfettered access to insects from the garden and partially composted goodies in the compost bin. This entry was posted in Uncategorized, Wildlife, Wildlife Gardening and tagged Didelphis virginiana, Virginia opossum by Tina. Bookmark the permalink. It was so nice to see your opossums in the box, they look so happy and peaceful there. Shame they had to move in to the owl box and you had to move them on, but I hope they can find somewhere else that’s safe for them. Would it be a case of too many possums and not enough homes for them around there? I agree that they were content and safe in there–they’d found good digs! Rest assured though, these are very adaptable animals–each will find a cozy spot to rest in during the day and their resting spots change. Even with the ideal spot up in our tree, the house was empty about half the time. 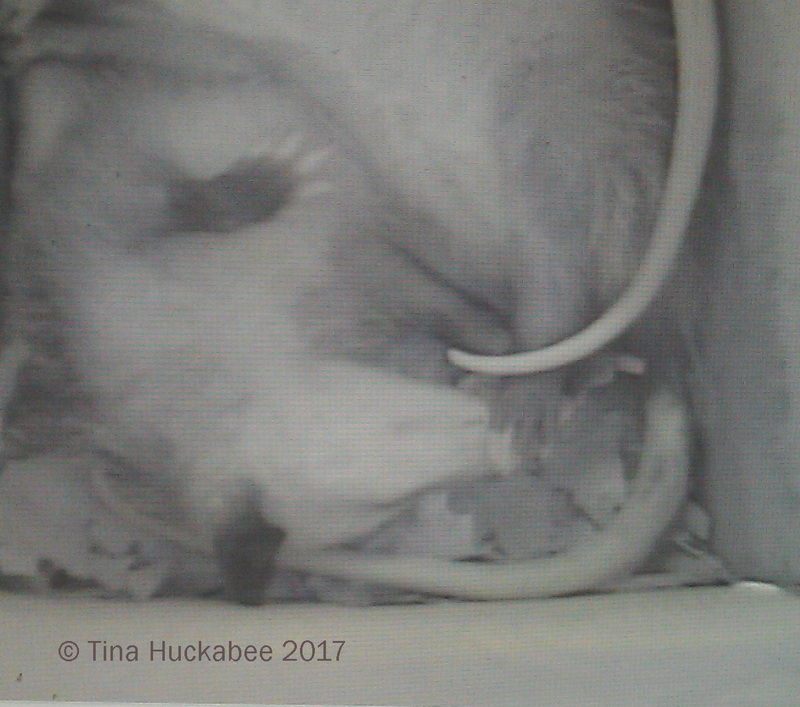 Our opossums don’t build nests, per se, but rather sleep where it’s convenient during their foraging, except for the expectant mamas who do build temporary nests. Wow, that’s awesome! We set up a trail cam for a while and seemed to be photographing space. I like your idea of putting it in a specific location of known wildlife habitation. I saw an opossum saunter through the backyard earlier in the spring. They are interesting creatures. I’d like to move the camera to different spots, but that would require more time than we currently have. Someone suggested that I place it by the pond and I’m sure that would be a wonderful place to see night critters, but maybe sometime in the future. Opossums are interesting and part of the fabric of our landscape–I just don’t want them hogging the the owl house! An ounce of prevention, pound of cure, and all that. It is delightful that you caught the siblings together. The only possums I’ve seen recently have been ones that forgot to look both ways before crossing the street. This is a fraught time of year for turtles, young squirrels, alligators — everyone’s out and about, trying to learn how to navigate through this world. There was a murmuration of grackels at the local HEB tonight — as large as I’ve ever seen. I kept looking at the various building rooflines, trying to figure out the identity of the different bird that was in line with them. Finally, I got it: each corner of the roof has an artificial owl. it’s meant to scare the birds away, I suppose, but I’ve never known an artificial owl able to replicate the real thing. Obviously the fake didn’t do its job! Sorry to hear about all the squished critters, but it’s tough when they traverse highways and byways–they don’t stand much of a chance. I like opossums, partly because they eat rats and ticks. Judy thinks they are terribly ugly, but I tell her many opossums find each other to be very attractive. They are cute cuddling in your owl box, but it seems you are right to avoid an awkward situation when it is time for them to make way for the owls. I like them too, Jason–or at least I tolerate them and just for the reasons you mention. I agree with Judy though, they are the most attractive of wildlife, though their babies are cute. Tina the pictures of the camera of the computer inside the box are impressive: to see as they sleep the family of opossums or the father alone. Very well done by covering the nest box of the Owls so that no one enters. Her friends the opossums continue to visit her to eat, they have not been angry. And the Owls also visited her. How wonderful! Your garden is a real Wildlife. Greetings from Margarita. It’s been interesting having the camera, though we were certainly disappointed that they owls didn’t show this year. I wouldn’t have minded if a mama squirrel would have taken up residence this summer and raised some kittens. She and they would have left the nest box well before owls showed up. I just can’t trust that opossums will do that–they like to stick around! What a sweet surprise. How strict and practical you are to board your box up, but I can understand and applaud your decision. I hope that you get your owls back! If I want owls, I really have no choice but to board up. I hope I get owls, too! I have not been happy with any of the invaders in our owl boxes; a family of squirrels, ants and wasps. We are not amused. Hopefully the opossums won’t remember what a safe haven they found when the door is once again opened. I wouldn’t have minded a mama squirrel coming in during summer then vacating when owl season begins, but those opossums, they just hang on, or maybe I should say, dig in! Opossums are cute when they’re asleep in your owl house but less cute when they’re wandering my garden. But I do respect them for their voracious tick appetites. How can you argue with that? Yes, they find ticks yummy and that means less of those obnoxious things around. I don’t really mind the opossums in the garden, but not, NOT in the owl house!